The image in this painting refers to Mary as a vessel who bore Jesus into the world. Mary is the container, the chalice, which the Father chose to hold the Savior of the world. In the same way the chalice is the vessel that carries the wine (Christ’s saving blood) to us in Communion. In the poem Mary is the container, the God-bearer. Mary is the Tabernacle, the object the Hebrews recognized as the earthly home of the Lord. 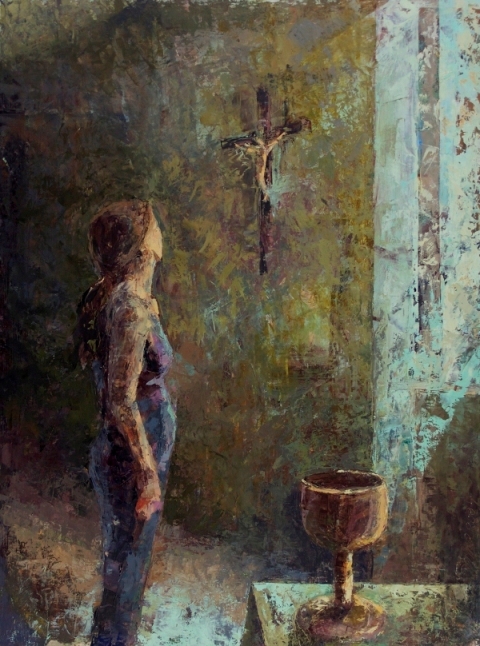 Here the woman looks at the Crucifix, which represents the suffering Christ. His suffering is painful to see, but it is through her act of listening and opening herself to God that redemption came into the world. The image evokes the memory of our mother Eve, whose disobedience brought sin into the world, culminating ultimately in the execution of Christ. Eve’s act of disobedience was redeemed in Mary’s obedient ‘May it be to me as you have said.’ Through Mary’s ‘yes’ the shriveled tree of the cross blossoms into life again, and through Christ’s ‘Thy will be done’ is able to bear the fruit of life and love once more.